We are pleased to announce six cash prizes for OU students who participate in the Anthropocene Biosphere project. Undergraduate and graduate students can win awards up to $125 in three categories: comments on blog posts; “live tweeting” a panel discussion; and writing an essay on the project. The Anthropocene Biosphere project involves an interdisciplinary group of OU faculty who are studying a new article by noted ecologist Erle Ellis, “Ecology in an Anthropogenic Biosphere.” The article attempts to explain what it is about human beings that enables them to massively transform the Earth. (Human impacts are so powerful that it is proposed that the planet has entered into a new geological period, the Anthropocene.) Ellis focuses in particular on the influence human beings have on ecological processes across the planet. His ideas are important for students in ecology, geography, anthropology, and anyone concerned with the condition of the environment. For the project OU faculty are posting short essays about the article on this blog. On April 14 Dr. Ellis will visit OU to meet with the faculty bloggers, and to present his ideas at a panel discussion in Meacham Auditorium, sponsored by the OU Humanities Forum, open to the OU community, and the general public. The six cash prizes are offered to encourage OU students to engage in the Anthropocene Biosphere project. Two prizes will be awarded for each of three activities—one for the best work by an undergraduate, one for the best work by a graduate student. Comments on blog posts. 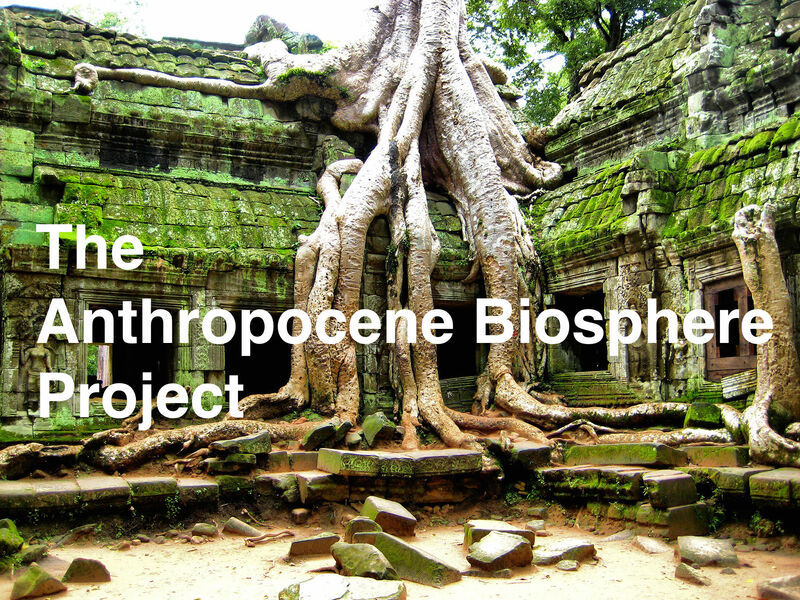 Students are invited to comment on any of the posts in the Anthropocene Biosphere series. Prizes of $75 will be given to the best sets of three comments (see guidelines below). “Live Tweeting” the April 14 panel discussion. Students who attend the panel discussion are eligible to submit a stream of tweets they post during the event. Prizes of $50 will be given to the best sets of five or more tweets (see guidelines below). Essay on the Anthropocene Biosphere project. Students who attend the panel discussion are eligible to submit an essay on the question, “How did the Anthropocene Biosphere project affect the way I understand the relationship between human beings and nature?” Prizes of $125 will be given to the best essays of 750-1000 words, and the winning essays will be posted on the Inhabiting the Anthropocene blog (see guidelines below). Any currently enrolled OU student in any major or department may participate in this competition. Students may enter for as many activities as they choose. See the guidelines below for instructions on how to enter. All entries will be judged the OU faculty participating in the Anthropocene Biosphere project. For further information, please contact Zev Trachtenberg (ztrachtenberg@ou.edu). You must write comments on three different posts in the Anthropocene Biosphere series (posts published between 1/25/16 and 4/8/16) on the Inhabiting the Anthropocene blog. and/or offer a critique of its view. Comments must be respectful and in a tone appropriate to academic discussion. Comments must be at least 100 words long. If you submit more than three comments you will be judged on the best three. Winners of these prizes will be announced at the April 14 panel discussion. “Live Tweeting” the April 14 panel discussion. To be considered for these prizes you must sign up in person at the April 14 panel discussion in Meacham Auditorium in the Oklahoma Memorial Union. You must use the Twitter hashtag for the event, to be announced that evening. Your tweets may include descriptions of what is being said, or questions to any of the panelists or in response to the discussion. Your stream will be judged on how well it represents the range of ideas presented over the entire evening. Winners of these prizes will be announced on the Inhabiting the Anthropocene blog the week of April 18. The winning tweet stream, along with other tweets from the event, will be posted on the blog. Essay on the Anthropocene Biosphere project. sign up in person at the April 14 panel discussion in Meacham Auditorium in the Oklahoma Memorial Union. Your essay must address the question “How did the Anthropocene Biosphere project affect the way I understand the relationship between human beings and nature?” by referring to one or more posts or comments on the blog AND the presentations and discussion at the April 14 panel (formal citation format not required). Winners of the prizes will be announced on the Inhabiting the Anthropocene blog the week of April 25. The winning essays will be posted on the blog.